I live in a country that accepts a greater than 50% collateral damage from drone strikes. In other words, most drone bombings kill humans, young, old, women, and children, who are guilty of proximity. Less than half of the drone bombings "successfully" kill their intended targets. 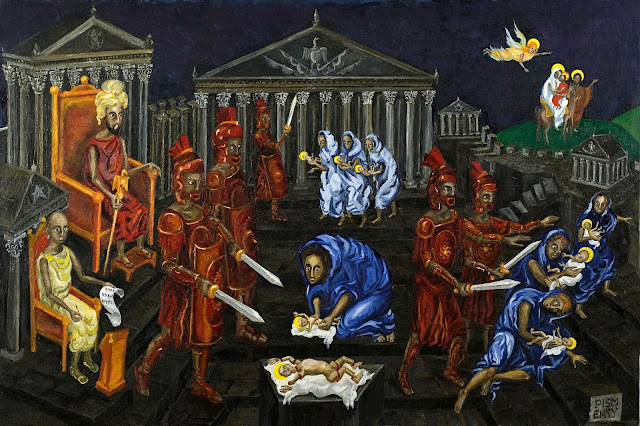 This painting is by Alexey Pismenny of the slaughter of the holy innocents, a liturgical feast day, yesterday, in the church calendar. The day before yesterday, the murderer of an innocent black boy playing with a toy gun, was not indicted for his crime, just like Herod. This morning, as I walked the dog, I was thinking about Luke's advent story. An angel appears to shepherds. That right there is a big deal. The angel is God's messenger from heaven and these guys are the dirty low lives of society who are working the only job available to them, cast out by society. The angel terrifies them so the first thing the angel says is "Fear not." Then the angel tells them the joyful news, a new Davidic king has been born. Ironically, they will find this king in a feeding trough. The new king appears in their area of derision, animal husbandry. Before they go visit the new king a heavenly choir of angels appears singing about peace and God's favor. Why did God incarnate himself as the baby Jesus? The abundant life only begins in this one. It continues in the next. Jesus will accomplish his task, either in this life or the next one. What then are we to do who have already begun this abundant life? Tell the good news, not "turn or burn." I listened for the second time in my life to a church service of lessons and carols with a trained choir and a serious pipe organ. There are seven lessons, all readings from the Bible to prepare us for the Advent. One of the readings was a mere 4 verses from Jeremiah 31:31-34. But when I read it today, in its totality, I could not believe they only picked these few verses. It's in Jeremiah 31 where Matthew references a fulfillment of Herod's slaughter of the innocents. But the chapter is mostly about God's unilateral restoration of his people despite their failings. I like John the Baptist. He was an outlier and his job was to comfort the afflicted and afflict the comfortable. He did it zealously and successfully. He dressed like a bum and was a freegan, eating bugs and wild honey. He was an ascetic, never drinking wine, nor ever cutting his hair. His parents were old when he was born and were among the religious elite. John did not follow in their footsteps. He called the religious elite a brood of vipers and died young, at the hands of the state, for speaking to power without fear. Today's Advent reading in the Daily Office includes Psalm 37. I think it's a great Psalm for all american Christians today who are worried about their siblings who think politically different from themselves. So for those who fear I put this here. I'm sure this Psalm also brought comfort to those who were waiting for their Messiah while under Roman occupation. I'm sure it brought comfort to those believers who hid in the Roman catacombs. I'm sure it brought comfort to those who suffered in concentration camps or the communist gulags. I'm sure it brought comfort to African-American slaves. It is a Psalm of hope beyond what we can see with our own eyes. Like spring flowers, they soon wither. 3 Trust in the Lord and do good. Here is the provocative assertion by Caleb Miller. So how do we begin this reconstructive process then? I’ve discussed the notion that there are only three axiomatic statements made about God in the bible.• God is love• God is light• God is father There is so much in these thee statements to cogitate on for the rest of my life yet more immediately in this Advent season. When I am angry or hateful - God is love. When I fear the darkness - God is light. When I feel vulnerable and unprotected and in need - God is father. It's a mad, mad, mad, mad world full of loud selfish people and quiet generous people. I want to be someone who is love, light, and parental. I want to advocate for those who lack love, light, and affection. In this Advent season I want to celebrate love, light, and universal siblinghood. Religious books from the ancient Near East can be dangerous in the hands of some people. Have you heard of the Hutaree? They were an apocalyptic group in the US that planned on starting a terrorist war in order to facilitate God's return and imposition of justice in the world. This past Sunday at church we sang O Holy Night, and I'm shocked at the liberal bias in this carol I thought was so innocent and supported me, Jesus, and 'murica. The liberal part is buried in the third verse. Truly He taught us to love one another;His law is love and His gospel is peace.Chains shall He break for the slave is our brother;And in His name all oppression shall cease.Sweet hymns of joy in grateful chorus raise we,Let all within us praise His holy name.Christ is the Lord! O praise His Name forever,His power and glory evermore proclaim.His power and glory evermore proclaim. At first I thought it must have been written by one of those Lincoln lovers with all that talk about setting slaves free. But it's origins are even worse than that. It is based on a poem by an atheist French poet, to the tune by a German, and arranged by a Unitarian minister. I can't read that commie French language but here is a translation of that liberal verse. Jerry Walls has condensed his three separate books on hell, purgatory, and heaven into this single 240 page volume. I am not saying this is a reader's digest version, just cut and pasted excerpts, it stands on its own, but he has made his thinking on these three topics available for those with commitment issues.